Three pretty diverse studies, yet it makes perfect sense if you understand how polyphenols work. Polyphenols inhibit the overproduction of inflammatory compounds made by the most ancient part of the immune system that we share with plants. The only trick is taking enough of these polyphenols. 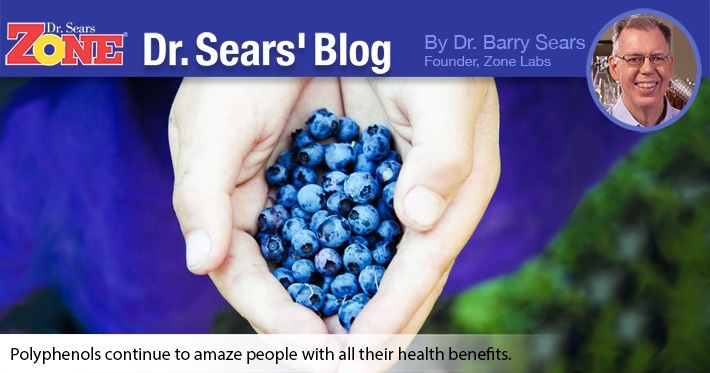 To get about 8,000 ORAC units every day requires eating about a cup of blueberries (lots of carbohydrates) or two glasses of red wine (lots of alcohol), or half a bar of very dark chocolate (lots of fat) or 0.3 g of highly purified polyphenol powder in a small capsule (with no carbohydrates, no alcohol, and no saturated fat). And if you are taking extra high purity omega-3 oil, exercising harder, or have an inflammatory disease, you will probably need even more polyphenols. It doesn't matter where the polyphenols come from as long as you get enough. That's why you eat lots of colorful carbohydrates on an anti inflammatory diet. Cassidy A, O'Reilly EJ, Kay C, Sampson L, Franz M, Forman J, Curhan G, and Rimm EB. “Habitual intake of flavonoid subclasses and incident hypertension in adults.” Am J Clin Nutr 93: 338-347 (2011). Dal-Ros S, Zoll J, Lang AL, Auger C, Keller N, Bronner C, Geny B, Schini-Kerth VB. “Chronic intake of red wine polyphenols by young rats prevents aging-induced endothelial dysfunction and decline in physical performance: Role of NADPH oxidase.” Biochem Biophys Res Commun 404: 743-749 (2011). Bowtell JL, Sumners DP, Dyer A, Fox P, and Mileva KN. “Montmorency cherry juice reduces muscle damage caused by intensive strength exercise”. Med Sci Sports Exerc 43: online ahead of print doi: 10.1249/MSS.obo13e31820e5adc (2011).